NEMBA buys land in Milford, MA to become the first cycling organization in the world to buy land for open space protection and recreation. 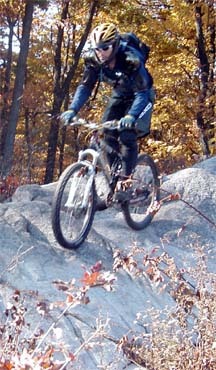 Milford, MA -- (October 21, 2003) -- The New England Mountain Bike Association (NEMBA) announced today that they have taken title to 47 acres of open space in Milford, Massachusetts in an area known as the Upper Charles River Headwaters. This campaign marks the first time that a mountain bike advocacy organization will purchase, own, and manage its own trail system, and the project marks the largest single investment undertaken by mountain bikers to preserve open space. NEMBA successfully raised the $210,000 needed to purchase the popular riding area two months before the option that was purchased in the fall of 2002 would run out. "We are thrilled to have raised the money” says Executive Director Philip Keyes. "When this historic project started a year ago, we had no idea of the ground swell of support that we'd receive from mountain bikers and the cycling industry. We believe that outdoors organizations should not only help public efforts to conserve open space, but that they should also undertake private measures to protect our landscapes from development and provide more outdoor recreational opportunities. The notion that a relatively small group such as NEMBA has the ability to preserve land has captured the imagination of individuals who would not normally donate to a land conservation project." The land acquisition is part of a complex partnership between numerous organizations trying to protect a patchwork of privately-owned open space totaling over 500 acres in the Upper Charles Headwaters area of Milford and Holliston. Some of the organizations that have been involved are The Trustees of Reservations, the towns of Holliston and Milford, Executive Office of Environmental Affairs, the Upper Charles Conservation Inc., and the Department of Environmental Management (now the Department of Conservation and Recreation). In addition to protecting the open space from development, there are plans to develop a rail trail near to the property. “I congratulate NEMBA on successfully raising the funds to protect key open space in Milford, Massachusetts," says Ellen Roy Herzfelder, Secretary of Environmental Affairs of the Commonwealth of Massachusetts. "This project is a great example of how non-governmental organizations can play an important role in preserving Massachusetts landscapes for the benefit of the public and the environment." While the majority of donations came from New England mountain bikers, individuals from all around the country contributed: Arizona, California, Colorado, Washington DC, Indiana, Maryland, Minnesota, North Carolina, New Jersey, New York, Pennsylvania, Tennessee, Texas, Virginia, Washington, and Wyoming. The International Mountain Bike Association (IMBA) challenged mountain bikers from around the country to support the cause by issuing a match for all individual donors outside of New England. IMBA’s Executive Director, Tim Blumenthal, said, "By raising a quarter million dollars to buy and preserve an important piece of land for our sport, NEMBA has again raised the bar for other mountain bike advocacy groups." The cycling industry also played a significant role. Local bicycle dealers --such as Wheelworks, Landry's, Cycle Loft, Bicycle Alley and Gear Works-- not only donated to the cause, but also worked with their suppliers and manufacturers to generate total donations of over $50,000. Clint Paige, president of Wheelworks, worked closely with the group to garner industry support. "I am very grateful to the key dealers in eastern Massachusetts and numerous regional and national suppliers that have helped us reach our $50K industry goal for this project," says Paige, "but none of this could have happened without the incredible commitment of NEMBA and its tireless leadership." NEMBA met its goal two months ahead of schedule; last year the organization purchased an option on the land for $15,000, an option that gave the organization until the end of this year to raise the money. Now that the deed is transferred, NEMBA plans to place a conservation restriction on the land to protect it from development and will implement its trail management plan to allow all non-motorized users free access to this popular area. NEMBA hopes that the site will become a model for the an environmentally sound trail system, a laboratory for trail building techniques, and an inspiration to other non-profit groups to preserve open space for conservation and recreation and to build their own trail systems. NEMBA will install a bronze plaque on the property to acknowledge the support of major individual and industry supporters, to be unveiled next spring. In the fall of 2003, as NEMBA's purchase of the Liner property seemed imminent, the NEMBA Board of Directors decided it would be a good idea to put together a land management committee to oversee Vietnam. It quickly became evident that even before a land management committee could be assembled, some thought needed to go into just what this committee would do, who would be on it, how they would be selected, and how this committee would interact with the NEMBA BOD. So, in the fall of 2003, the Vietnam Land Management Steering Committee was born made up of a group of NEMBA BOD members. This group put together a "guiding principles" document that built upon work that had been done by the original major donors to the Vietnam Land Preservation Fund. Additionally, an outline for an overall land management plan was produced. The Vietnam Land Management Committee still functions today though many of its volunteers have changed. Over the years, the committee focused on putting together short- and long-term goals for managing the property. The first short term goal was to work the political channels with the Holliston and Milford Conservation Committees to establish ourselves as "good neighbors." It was essential that we proved that we were responsible and would be good stewards of the land. While NEMBA owns about 47 acres, the total Vietnam area consists of almost 1000 acres, so it was imperative that we presented a good image. This was essential so that we could continue to ride the entire area. Also, since NEMBA's property is land locked, access is only through our neighbors' properties. The really fun part of owning the Vietnam property and managing the trail system is change. Rerouting, upgrading the old, and/or creating new trails continues today and will never cease. Going forward NEMBA intends to continue to improve the trails on our property and, working with surrounding landowners and the towns of Milford and Holliston, on the entire conservation parcel. 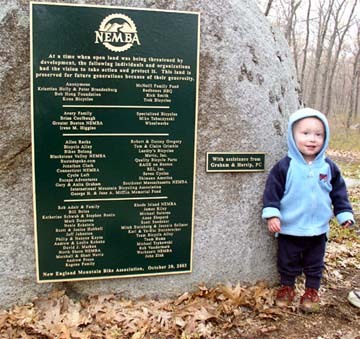 On April 30, 2004 the New England Mountain Bike Association (NEMBA) unveiled the bronze plaque to commemorate the organization's purchase and preservation of the Vietnam trails in Milford, Massachusetts . NEMBA was the first mountain bike group to purchase, own and manage its own property. Forty of the 57 major donors listed on the plaque were in attendance to celebrate NEMBA's success and to ride the property. Kona Bicycles, the largest bicycle industry donor, sent freerider Dave Watson as their representative and ride leader. Also, in attendance from the bicycle industry were representatives from Wheelworks, Landry's Bicycles, Milford Bicycles, Seven Cycles, Bustedspoke.com, REI and the International Mountain Bike Association. "This was a proud and emotional event for me," said NEMBA executive director, Philip Keyes. "This property and plaque will forever stand as testimony to mountain bikers' dedication to the future of trails and open space. It shows that mountain bikers can positively impact both the sport and the planet for future generations." NEMBA purchased the 47 acres on October 23, 2003 after more than a year of fundraising that grew from the grassroots to become a national campaign, with 549 donations coming from 23 states. The donors listed on the plaque gave a $1000 or more, with some individuals contributing $15,000 toward the purchase. Since the plaque was located deep in the forest, everyone rode to the site of the ceremony, and enjoyed the technical antics of Kona's Dave Watson during a tour of NEMBA's property. The ride featured a brand-new trail NEMBA had created that past fall to rave reviews. Text by Mitch Steinberg & Others.